My teenage daughter has a basement bedroom, one she doesn’t want to share with either her sister home from college or creepy crawlies from outside. She is always dismayed, then, when she finds either in her room, especially a creepy crawly. And the one that bothers her is the most is the centipede. With the onset of colder weather, we have been seeing centipedes around the house more often. Most likely, they are coming in around her windows (they are ground-level) or under our doors. 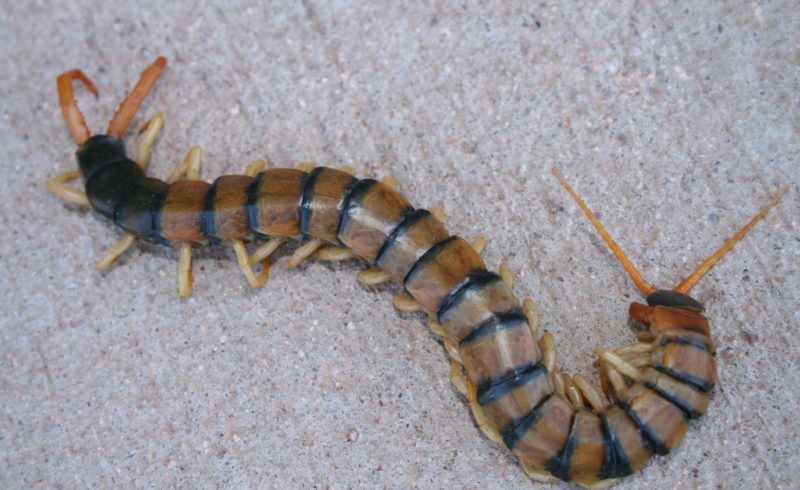 Centipedes sometimes come inside if too much rain or moisture forces them out of the soil. 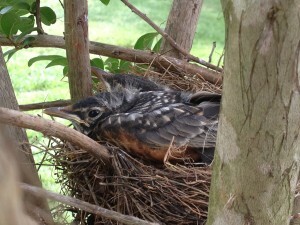 They might also be looking for a protected place to overwinter. But my daughter has made a clear declaration: they will not be overwintering with her. We did some research to find out if these animals were actually harmful or just unsettling to find crawling across the floor. We found out that centipedes have powerful jaws, but these are used for catching insects. Then they kill their prey by injecting it with venom. While a person may be bitten by a centipede, the venom usually produces just a moderate reaction, one similar to a bee sting. However, people who are allergic to insect venom can have a much more severe reaction. So What is a Centipede, Anyway? What exactly are these creatures crawling across the floor with poison in their tiny jaws? Although they are related to insects, centipedes actually belong to the group known as Myriapods, or the “many-legged ones.” This group also includes millipedes and roly-polys. Centipedes have long, flattened bodies and a pair of long antennae. Depending on the species, they vary in length from 1 to 12 or more inches long. They also vary in color, from light yellow to reddish brown to dark brown. Although they are found in many types of habitats, they prefer dark, moist areas such as those found under rotted logs, leaves, or stones. Some centipede species have been known to live up to six years. Fortunately, I haven’t seen any house centipedes yet. I think I prefer the ones that come in from outside. 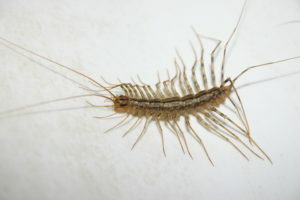 House centipedes are the most common centipedes found in homes. 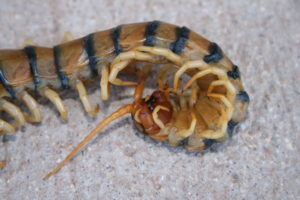 They are the only centipedes that can reproduce indoors. Growing to about an inch long, house centipedes have long, flat, light brown or grayish-yellow bodies. They have 15 pairs of jointed striped legs and can move quickly; they are sometimes seen running across a wall or ceiling. While their appearance can be disturbing, house centipedes aren’t harmful to food, clothing, or furniture. In fact, they’re good to have around. They are active at night, searching for prey such as cockroaches and other insects. However, I think if my daughter ever saw them racing across her room, she would move out of the basement ASAP. “’Horrific’ First Amphibious Centipede Discovered.” National Geographic. 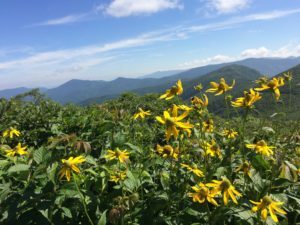 “Millipedes and Centipedes.” University of Georgia Extension.